Tear through clumps and hardened materials with the double-edge tines. Till and mix the soil with compost materials to prepare the ground. Built for easy and efficient soil preparation, the tiller attachment quickly turns a backyard plot into a soil bed for gardening. Bi-directional operation allows for top-cutting and under-cutting in either direction. 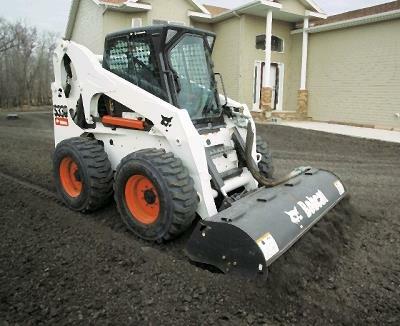 Mounts to most mid sizes skid steer loaders with flush face fittings. * Please call us for any questions on our skid steer tractor tiller 60 inch wide rentals in San Jose, Campbell, Salinas, Santa Cruz, Watsonville, Morgan Hill, Hollister, Santa Clara, Gilroy, Milpitas Sunnyvale, Fremont, Salinas, the Greater Bay Area and the Monterey Peninsula.